It wasn’t until humans began gathering in larger populations that contagious diseases had the opportunity to spread to epidemic proportions. Infectious diseases have inflicted a great deal of damage throughout the centuries. While the Hawaiian Islands are the world’s most-isolated, populated-place, exploration and trade in the Pacific – and eventually “contact” – ultimately exposed Hawaiʻi to the ills already circulating around the globe – and added it to the points of contact for the spread of various diseases. The maʻi ‘ōkuʻu (believed to be cholera) struck the islands in about 1804. Some reports note about one-half the population (175,000) died, however, some feel that is quite likely that close to 5,000 Hawaiians died from it. (Schmitt) It affected Kamehameha and his planned invasion of Kauaʻi. As visits by whalers, traders and others increased, other serious diseases started arriving from Europe, American and Asia. Smallpox hit Hawaiʻi in 1853; the first case arrived in Honolulu, on the ship Charles Mallory. When the epidemic ended late in January 1854, the estimated number of islands-wide cases was 6,400 – 9,100 and an estimated 2,500 – 5,750 deaths. The bubonic plague (“Black Death”) was first noticed in Hawaiʻi on December 9, 1899. Its presence caused pause in the opening months of 1900 and was on everybody’s mind, with good reason; the same disease had decimated a third of the world’s population during the fourteenth century. The spread of plague on O‘ahu was traced to the railroad linking Honolulu with the plantation towns of Aiea, Waipahu and Waialua. The Honolulu epidemic was not halted until March 31, 1900, during which time a total of 71 cases of plague were diagnosed, leading to 61 deaths. The Black Death was one of the most devastating pandemics in human history, peaking in Europe in the mid-1300s, and killing between 75-million and 200-million people. It was thought to have started in China or central Asia. It then travelled along the Silk Road and was probably carried by Oriental rat fleas living on the black rats that were regular passengers on merchant ships. Spreading throughout the Mediterranean and Europe, the Black Death is estimated to have killed 30 to 60 percent of Europe’s population. All in all, the plague reduced the world population from an estimated 450-million to a number between 350 and 375-million in the 14th century. The epidemics of infections diminished Hawaiʻi’s population from approximately 300,000 at the time of Captain Cook’s arrival in 1778 to 135,000 in 1820 and 53,900 in 1876. 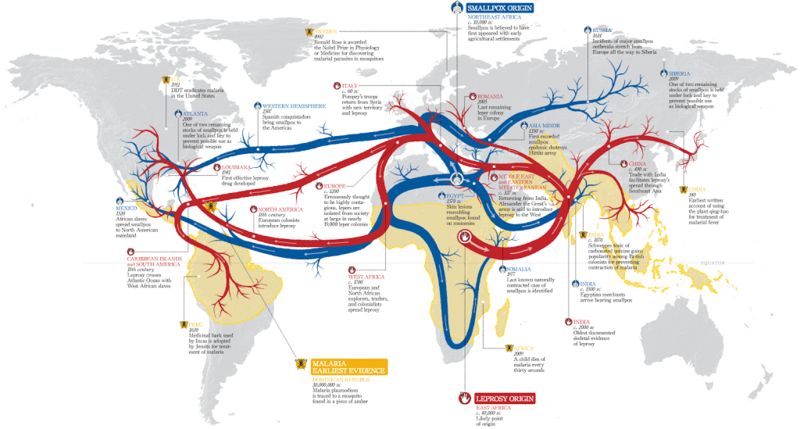 The image shows a map of the origins and paths of smallpox and other epidemics across the globe. In addition, I have included other images in a folder of like name in the Photos section on my Facebook and Google+ pages.